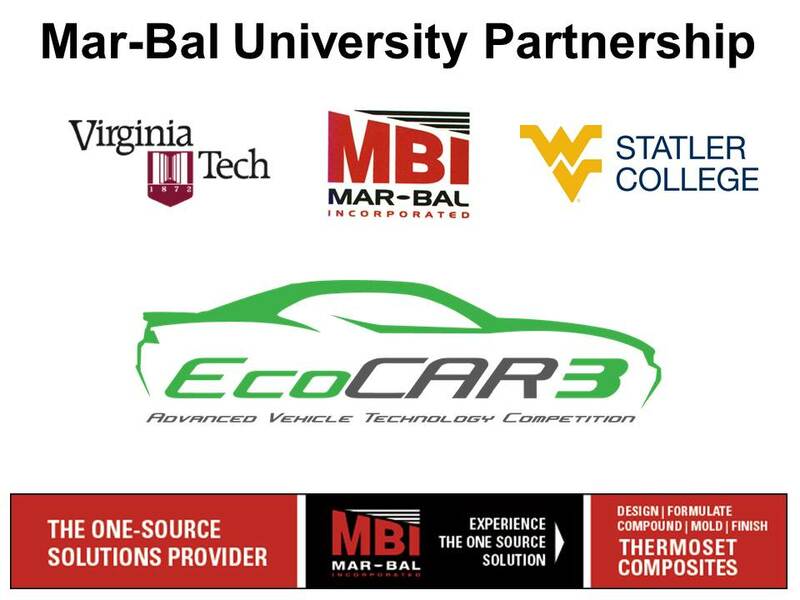 Mar-Bal Partners with University EcoCAR 3 Teams | Mar-Bal, Inc. Chagrin Falls, OH (November 3, 2015) – Virginia Tech (VT) students “invent the future” every day through research and creativity. The Hybrid Electric Vehicle Team of Virginia Tech (HEVT) is doing just that as they take on a four-year hybrid vehicle competition. HEVT has been working on advancing vehicle technology since 1994. The team is currently comprised of around 50 undergraduate students who are competing in EcoCAR 3, a collegiate competition sponsored by General Motors and the U.S. Department of Energy. Sixteen colleges are participating in the competition, with the goal to reengineer a 2016 Chevrolet Camaro to be more fuel-efficient, all while maintaining aspects such as safety and performance. EcoCAR 3 is split into four one-year phases, with a competition at the end of each phase. Currently, HEVT is in year two of the competition, the design phase. HEVT placed second at year one competition. The competition gives VT students the opportunity to apply what they have learned in the classroom to a meaningful experience. Technical challenges and barriers due to limited experience are two of the obstacles HEVT has encountered. West Virginia University (WVU) is also participating in EcoCAR 3. HEVT is serving as a mentor to WVU, assisting with the technical standpoint of the project. However, each team has mutually assisted each other along the way. Dr. Andrew Nix, a Virginia Tech alumnus, is WVU’s EcoCAR 3 academic advisor. Nix won the advisor of the year award in April 2015 for all EcoCAR 3 teams. Mar-Bal has sponsored both VT and WVU EcoCAR 3 teams, and has spoken to the WVU team to raise awareness about composites. Mar-Bal plans to speak to HEVT on November 9. For more information about HEVT visit http://ecocar3.org/vthevt/about-us/ and https://www.facebook.com/vtHEVT. For more information about EcoCAR 3 at WVU visit http://ecocar3.org/wvu/about-us/ and https://www.facebook.com/wvuecocar3. For more information about Mar-Bal, Inc., visit: www.mar-bal.com or call 440-539-6595. Press Release drafted by Ashlyn Davidson, PR Intern for Mar-Bal, Inc. and a Senior Public Relations Major at Virginia Tech. This entry was posted in News and tagged composites, engineering, research, university on November 3, 2015 by Ron Poff.